Space is gigantic, so even though we have giant dishes trained to listen to it, we only hear a tiny slice. But scientists manning the Parkes radio telescope in New South Wales, Australia stumbled on a few blips worth hearing: four mammoth radio blasts that came from far outside the galaxy. It's not uncommon to heard the pop and hiss of radio signals when you've got huge dish pointed at the sky, but most of those tiny noises originate from somewhere in the Milky Way. "Close" by interstellar standards. These signals, which actually reached Earth between February 2011 and January 2012, had traveled a much longer way; scientists calculated that all four plowed through much more plasma than is even contained in our Milky Way. And they were loud too; each packed energy roughly equivalent to what the sun puts out in 300,000 years. What caused them is unknown, and considering each was mere milliseconds long, there's not too much to study. 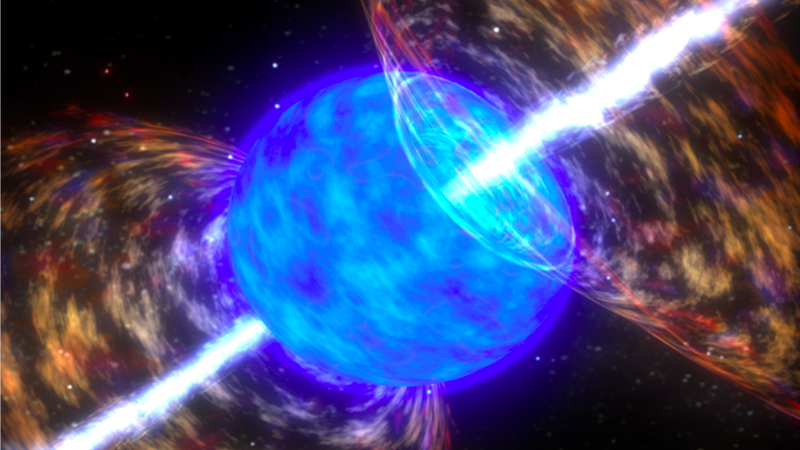 Scientists still have their guesses though, which include colliding magnetars—magnetically charged neutron stars—, evaporating black holes, or gamma ray bursts. You know, big stuff.